Stuff. I get stuff. Mostly for free. And here are some reviews! Let's be honest. I have a freakish lot of cookie sheets. When I was baking croissants for Thanksgiving, I used nine half-sheet pans, and still had more in storage. But this one, with its copper-colored surface caught my attention. Honestly, my cookies don't care all that much about cookie sheet color (although light or dark can make a difference) but cookies will look snazzy on this one. I have another Air Bake pan in basic aluminum, and it's very useful as a pizza peel. This one should be even better, because it's nonstick. I'm actually thinking about getting a whole set of these, just because the color is cool. Before I said yes to these knives, I looked them up online. Kenji Lopez-Alt loved them. Some other guy went into lots and lots of detail about the pros and cons of different types of metal that are used in knives. Somewhere along the line he said that the knives were nice but not the best he owns. So ... after living with these for a while, I like them. They're a little heavier than other knives I own, but it's a comfortable and well-balanced weight, so it's not tiring. They arrived very sharp and the edge has remained. Are they the best knives I own? Heck, I don't really know. Every knife I have has a unique shape and its own purpose because of that shape. But if you're looking for a knife, I'd suggest looking at these. Because there's no middleman taking profit from their sales, they're a good value. Plus, the blue handle is different among all the dark-handled knives in my collection. Oh, and inside the box is a diagram of how to properly hold the knife, so that's great for folks who are a little new to kitchen knives. When I saw these, I thought they were a little weird, but then after fiddling with them for a while I understood the concept. When you're looking at a measuring cup that has multiple measuring options, it's easy for the eye to drift from one scale to another. Then there's a baking fail because someone looked at milliliters instead of ounces. Here, there is a window that shows one single scale while the rest of the measuring cup is covered. 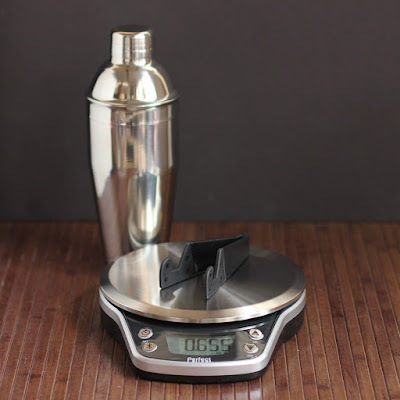 The smaller 2-cup measure is shaped more like a beaker and fits neatly into the larger 4-cup measure for storage. The outer cover snaps on and off easily for cleaning. These are simply cute. There's no other way to describe them. They nest for storage and would look cute on display. Although I'm not so much into super-cute-pink-and-girly things, I'm sure there are plenty of people who would squeeeeeeeeeee over these. They would also be cute for kids who are learning about math, measuring, and baking. And they're real measuring cups and spoons, so they're not just for show. Squeeee. Pink. iChef is a remote thermometer for roasting and barbecuing. Not only is there a base unit, but there's an app that can be used to monitor what's cooking. 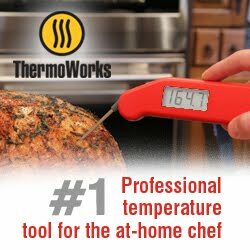 At the Housewares Show in the spring, I saw a new version of this that worked with Alexa, and I was hoping to see that available, but I don't see that option on any thermometers at the moment. Ah well. I'm still hoping that it will be showing up on the market soon. In the meanwhile, the remotes from Maverick have performed well for me, and the app is pretty handy. I saw a whole bunch of these at the Housewares Show earlier this year. Lots and lots of options. The general idea is that they're special lids for standard canning jars that transform the jars into fun or useful objects. The pump jar top is great for soap but could also be used for ketchup or mustard at a barbecue. The drinking top turns the jar into a sippy cup. And the fun favorite is the kit for turning the jar into the perfect habitat for holding lightning bugs until their release later. There are more. Lots and lots more. There was a whole wall full of these, so check them out. Oh, coffee, how many ways can I love you? The Melitta pour over thingie (I'm sure there's a name for it. I'm sure it doesn't matter) makes it easy to brew a cup of coffee at a time. The Melitta folks sent me a ceramic pour over device (which also comes in an unbreakable version as well as a metallic one) along with filters and coffee. I've actually been having fun brewing the single cup of flavored coffee or decaf or whatever suits my mood. This is super-easy to use. The coffee filters have marking for different amounts of coffee to vary the strength or the amount of coffee brewed. Then you just need hot water. Oh, and the flavored coffee was good, too. When I saw this little colander, I thought it was a little odd. I mean, it's not like it's big enough for straining a pot of soup stock, which is one of the major uses of strainers and colanders around here. But then I had another idea. Instead of pouring stuff through it, it's super-easy to use it to scoop the large bits out of the pot of soup. After the big stuff is gone, I can strain the rest through a fine strainer and I'm done. Since it collapses, it stores easily, which is a HUGE bonus. It would also be fine for straining small amounts of stuff, like emptying a can of beans into it. Or for washing a hand full of berries. I'm still keeping my big colander for big jobs, but I've used this a lot more than I expected to. Using a mandolin or even a grater in the kitchen can be a little dangerous. Heck, some people have problems with knives. So cut-proof gloves make a whole lot of sense. And they're thin enough so you don't lose dexterity. These aren't puncture-proof, so you cans still get stabbing injuries if you happen to poke yourself with something sharp, but if you lose your grip on a potato and slide your hand along the surface of a grater, you'll be fine. These come in three different sizes. These bowls are cute, colorful, and I've used them more times than I thought I would. The bowls nest and the rims create a flat top, so you could store something on top of them and it wouldn't wobble. These come in a couple different colors, combined with white. Got a sense of humor? These paper cocktail napkins and cloth kitchen towels have your name on them. Well, not your actual name, probably. But they're fun for parties or just for times when you want a little giggle. They'd also make a nice housewarming gift, tucked in with a couple other items. I get stuff for free for reviews all the time. Like these. Norpro Kitchen Products have a wide variety of products which you can choose from and have them delivered internationally.